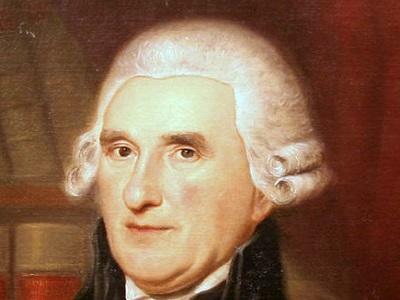 Thomas McKean was a President before George Washington and supported judicial review before John Marshall. But today, McKean is mostly forgotten in the discussion about Founders who had a significant impact on the Constitution and the early Supreme Court. McKean also had the interesting distinction of serving in the Continental Congress from one state (Delaware) while serving as Chief Justice of another state (Pennsylvania) for more than five years. He was born in Pennsylvania on March 19, 1734 to parents who were Irish Protestants. He moved to Delaware as a teenager to study the law. McKean moved up quickly in political and legal circles. In 1765, he represented the “Lower Counties” of Delaware during the Stamp Act crisis. McKean also represented Delaware in the first two Continental Congresses, fought alongside George Washington and he briefly served as President of the Continental Congress in 1781, as British forces surrendered at Yorktown. But in an interesting twist, McKean led a double life of sorts: While in served in Congress as a representative from Delaware, he was also the Chief Justice of the Pennsylvania Supreme Court. In this role, McKean was a prominent early supporter of a strong judiciary, one strong enough to overturn a state law, if needed, as unconstitutional. He served for 22 years as Chief Justice for one of the most-influential state courts in the new republic. Although McKean wasn’t a delegate at the 1787 Constitutional Convention in Philadelphia, he worked with another important legal figure, James Wilson, to secure Pennsylvania’s ratification vote for the new Constitution. In 1790, Pennsylvania changed its own constitution to mirror the federal Constitution, and the state’s Supreme Court, led by McKean, issued several rulings in the following decade that embraced the concept of judicial review. United States Supreme Court Chief Justice John Marshall’s ruling in the famous Marbury v. Madison case in 1803 established the federal precedent of a court’s power to overturn an unconstitutional law, but the Pennsylvania court decisions, along with some writings from Wilson, helped to establish the foundation of judicial review as an important check on legislative powers. McKean left the court in 1799 to become Pennsylvania’s governor. Already a controversial figure in the state, dating back to the days when he served in the Congress and as a Chief Justice at the same time, McKean left the Federalist party and fought against them over state patronage positions. He switched back to the Federalists in his third campaign for governor in 1805, survived an impeachment attempt, and then retired from politics at the end of 1808. And there is another interesting footnote about McKean: He voted to approve the Declaration of Independence in July 1776, but he left Philadelphia before the document was signed, to rejoin the fight against the British. Historians believe he was the last person to sign the document, either in early 1777 or as late as 1781.